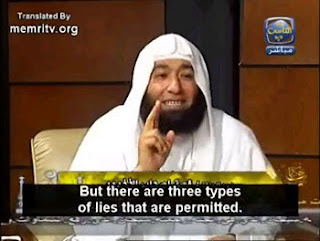 Yet if Muslims are exhorted to be truthful, how can deceit not only be prevalent but have divine sanction? What exactly istaqiyya? How is it justified by scholars and those who make use of it? How does it fit into a broader conception of Islam's code of ethics, especially in relation to the non-Muslim? More to the point, what ramifications does the doctrine of taqiyyahave for all interaction between Muslims and non-Muslims? This is the classic definition of the doctrine of taqiyya. Based on an Arabic word denoting fear, taqiyyahas long been understood, especially by Western academics, as something to resort to in times of religious persecution and, for the most part, used in this sense by minority Shi'i groups living among hostile Sunni majorities. Taqiyya allowed the Shi'a to dissemble their religious affiliation in front of the Sunnis on a regular basis, not merely by keeping clandestine about their own beliefs but by actively praying and behaving as if they were Sunnis. Even though Shari'a mandates Muslims to abide by treaties, they have a way out, one open to abuse: If Muslims believe—even without solid evidence—that their opponents are about to break the treaty, they can preempt by breaking it first. Moreover, some Islamic schools of law, such as the Hanafi, assert that Muslim leaders may abrogate treaties merely if it seems advantageous for Islam. This is reminiscent of the following canonical hadith: "If you ever take an oath to do something and later on you find that something else is better, then you should expiate your oath and do what is better. "And what is better, what is more altruistic, than to make God's word supreme by launching the jihad anew whenever possible? Traditionally, Muslim rulers held to a commitment to launch a jihad at least once every year. This ritual is most noted with the Ottoman sultans, who spent half their lives in the field. So important was the duty of jihad that the sultans were not permitted to perform the pilgrimage to Mecca, an individual duty for each Muslim. Their leadership of the jihad allowed this communal duty to continue; without them, it would have fallen into desuetude. 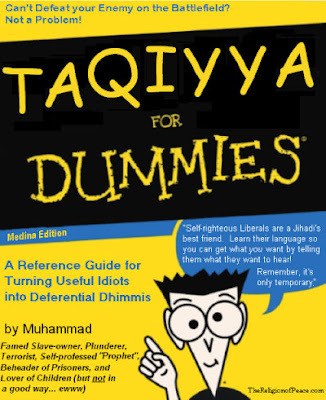 It must, therefore, be accepted that, contrary to long-held academic assumptions, the doctrine oftaqiyya goes far beyond Muslims engaging in religious dissimulation in the interest of self-preservation and encompasses deception of the infidel enemy in general. This phenomenon should provide a context for Shi'i Iran's zeal—taqiyya being especially second nature to Shi'ism—to acquire nuclear power while insisting that its motives are entirely peaceful. Nor is taqiyya confined to overseas affairs. Walid Phares of the National Defense University has lamented that homegrown Islamists are operating unfettered on American soil due to their use oftaqiyya: "Does our government know what this doctrine is all about and, more importantly, are authorities educating the body of our defense apparatus regarding this stealthy threat dormant among us?" After the Fort Hood massacre, when Nidal Malik Hasan, an American-Muslim who exhibited numerous Islamist signs which were ignored, killed thirteen fellow servicemen and women, one is compelled to respond in the negative. Paul E. Walker, The Oxford Encyclopedia of Islam in the Modern World, John Esposito, ed. (New York: Oxford University Press, 2001), vol. 4, s.v. "Taqiyah," pp. 186-7; Ibn Babuyah, A Shi'ite Creed, A. A. A. Fyzee, trans. (London: n.p., 1942), pp. 110-2; Etan Kohlberg, "Some Imami-Shi'i Views on Taqiyya,"Journal of the American Oriental Society, 95 (1975): 395-402. Abu Ja'far Muhammad at-Tabari, Jami' al-Bayan 'an ta'wil ayi'l-Qur'an al-Ma'ruf: Tafsir at-Tabari(Beirut: Dar Ihya' at-Turath al-'Arabi, 2001), vol. 3, p. 267, author's translation. Ibn Qayyim, Tafsir, in Abd al-'Aziz bin Nasir al-Jalil, At-Tarbiya al-Jihadiya fi Daw' al-Kitab wa 's-Sunna(Riyahd: n.p., 2003), pp. 36-43. Ahmad Ibn Naqib al-Misri, Reliance of the Traveller: A Classic Manual of Islamic Sacred Law(Beltsville: Amana Publications, 1994), p. 605. Qur'an (16:106) - Establishes that there are circumstances that can “compel” a Muslim to tell a lie. Qur'an (9:3) - “…Allah and His Messenger are free from liability to the idolaters…” The dissolution of oaths with the pagans who remained at Mecca following its capture. They did nothing wrong, but were evicted anyway. However, it was the last day of Rajab – a sacred period in the Arabian custom on which fighting and violence were prohibited. This breach of centuries-old sacred custom, which was devoutly respected by the people of Arabia, created a great dissatisfaction amongst the citizens of Medina including the Muslim converts. This is a list of battles fought during Ramadan by Muslim. 624 - Battle of Badr. On 17 Ramadan, Makkan idolaters attacked the young islamic state of Madina. Muhammad led his forces in Arabia to victory over Makkan idolaters. 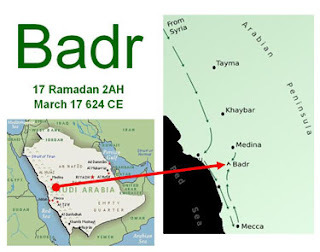 "The great battle of Badr" , was the first battle between Muslims and infidels. 630 - Battle of Tabouk (also called the Battle of Tabuk). The soldiers of Islam, under the leadership of Muhammad, established a training and fighting camp in Tabouk during the month of fasting, the Byzantine army shown no aggression so the Muslims returned peacefully without fighting. 1099 - Battle of Ascalon. Took place on 22 Ramadan (August 12), the newfound crusader Kingdom of Jerusalem defeated Fatimid Egypt. 1187 - Battle of Hattin. Took place at dawn—after the Night of Power (Lailat ul-Qadr); a night during the last ten days of Ramadan when tradition says that the angel Gabriel descended and God called Muhammad to be His messenger. (It is sometimes translated as the Night of Destiny.) Sultan Saladin (Salah Al-Din Al-Ayubi) wiped out the Frankish army and went on to reclaimJerusalem for Islam. The battle took place on July 4. 1260 - Battle of Ain Jalut. Qutuz defeated the Mongols in Palestine. 1973 - Ramadan War (Elsewhere known as the Yom Kippur War). Egypt and Syria launched an attack on Israel called Operation Badr, and foot soldiers were given religious slogans. The Yom Kippur War is also known as the 6th of October war of 1973 and the 10th of Ramadan War. 2003 to 2007 - Iraq War. Fighting took place over the course of four Ramadans.